Shampoo is such an accepted part of life that you might not think of spending much time examining the ingredients list on the bottle. But it's worth reading the fine print. Certain ingredients can do more harm than good to your hair -- and others may have adverse effects on your overall health. 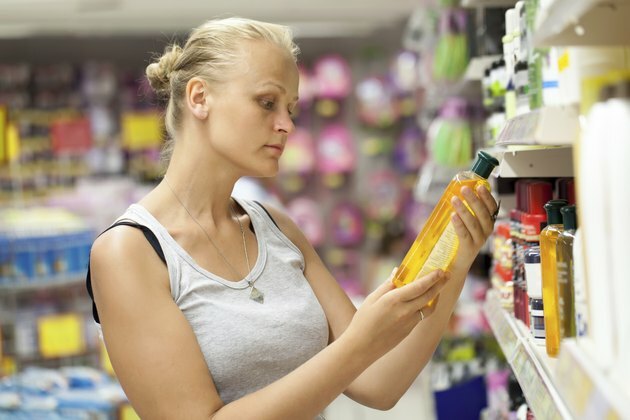 If you see certain ingredients on the label, best to put the bottle back on the shelf and choose another brand. Sulfates are detergents that give shampoos their foamy lather. They go by many names -- sodium lauryl sulfate, sodium laureth sulfate, ammonium laureth sulfate and ammonium lauryl sulfate. Sometimes these compounds are identified only by their initials -- SLS for sodium lauryl sulfate and SLES for sodium laureth sulfate. Sulfates may help your shampoo produce suds, but they can also strip your hair of its natural oils, leaving it overly dry and prone to damage. Sulfates can also irritate the skin. Isopropyl alcohol is sometimes included in shampoos because it cuts through oil effectively. The problem is that it does its job a little too well. Like sulfates, isopropyl alcohol's main concern is that it's extremely drying to your hair, stripping it of moisture. This leaves it prone to frizziness and vulnerable to damage. Propylene glycol is added to shampoos partly to help with their consistency and partly to help your hair and scalp better absorb other ingredients in the shampoo mix. Unfortunately, this compound is a well-known skin and eye irritant -- not a great idea when you think about how often suds end up coursing down the front of your face during a typical shower. Parabens are added to shampoos to act as a preservative -- in other words, to keep bacteria and other microbes from colonizing the contents of your bottle. Sounds like a good idea on paper. Unfortunately, parabens are suspected endocrine disruptors, meaning that they may also play a role in certain cancers. More study is needed to confirm or dispel this link. Avoid anything with the suffix -paraben on the label, such as methylparaben, butylparaben or ethylparaben. Formaldehyde is another chemical used as a preservative in shampoos and other cosmetic products. Unfortunately, it is highly irritating to eyes and skin. It is also a known animal carcinogen, and there is increasing evidence of a possible cancer risk in humans as well. While the concentrations of formaldehyde in shampoos is low, the health risks are clear enough that it's best to avoid this ingredient entirely whenever possible.